Sometimes you need to find the last virtual machine a user logged into. This could be for numerous reasons, but one of the main reasons I need to find the last virtual machine a user logged into is so I can review events in the Application, Security, System, Citrix logs or UPM/Application log files for a reported issue. Most people probably already know how to find the last virtual machine a user logged into, but I figured I would share it anyways because I’ve already shown a couple people that didn’t know it was possible from within XenDesktop Studio. Click on the Delivery Group Node. Double click the Delivery Group you want to view additional information on. 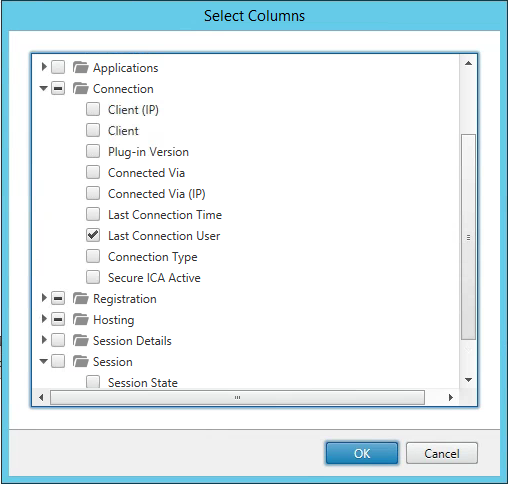 Either Right click anywhere on the column title bar or click on Select Columns from the Actions menu on the right side. Scroll down to Connections, then select Last Connection User and click OK.
Another column will show up and you can now sort by last connected user to help track down which virtual machine the user last logged into. After I locate the username and find the last virtual machine they logged into, I can open up Event Viewer and then view the Event Logs remotely from my XenDesktop machine. ← Allow Additional Time for Applications or Desktops to Start.